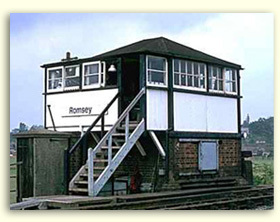 Until 1982 Romsey Signal Box controlled the railway junction at Romsey in Hampshire, with passenger and freight trains running between Southampton and Salisbury and a branch line leading down to Eastleigh. The resignalling works carried out by British Rail meant that the box wasn’t needed any more, and it was scheduled for demolition. Romsey & District Buildings Preservation Trust stepped in and bought the signal box and its lever frame, and with the co-operation of the local authorities the signal box was lifted into the grounds of the adjacent infants school. 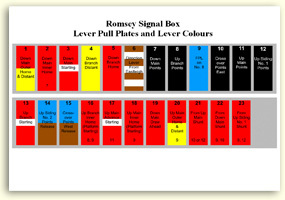 The Friends of Romsey Signal Box then became involved and restored the signalling equipment to working order. 1850s to 1940s – construction and expansion. The first requirement for a signal box at Romsey would have been in connection with the opening of the Redbridge branch on 6th March, 1865. The preserved box probably dates from around 1871, and so we believe it was one of the oldest boxes still in service when it was closed in 1982. When it was first built, the box was almost certainly constructed entirely of wood (both floors). It controlled the junction between the double-track Eastleigh-Salisbury main line and the single-track branch to Southampton via Redbridge. As was the fashion at the time, the signals controlling the junction would have been placed on the roof of the signal box itself. This is why the box is deeper than it is long (disregarding the later extension) as each signal post would have been at the tips of the hipped roof. The posts coming down through the floor must have been a bit of a nuisance! The levers in the box today were first installed in 1884 for the doubling of the Redbridge branch, when an 18-lever frame was installed, and this lasted at least until the First World War. At some time between 1917 and 1925 the box was extended with the addition of the flat-roofed overhanging section on the first floor, and the frame was extended, receiving a further seven levers. This may also have been when the wooden base was replaced by a brick one. The track layout developed with additional sidings until it reached its maximum extent by 1944. On the embankment above the present location of the signal box there were several sidings and the goods yard was extended to cope with wartime traffic. The sidings at the Kimbridge end of the station have always been controlled by a ground frame, which had six levers in 1944. A second ground frame controlled the siding off the Redbridge branch south of Winchester Road, which served Wills’ (now Hillier’s) Nursery from 13th February 1928. The gradual decline in freight traffic, which started with the closure of Wills’ siding on 2nd August 1959, continued with the closure of Romsey Goods yard on 20th July 1970. In the meantime, the line from Eastleigh through Chandlers Ford was closed to passengers on 5th May 1969, and the line was converted to single track on 1st May 1972. This singling coincided with the start of the conversion of mechanical signals to colour lights. 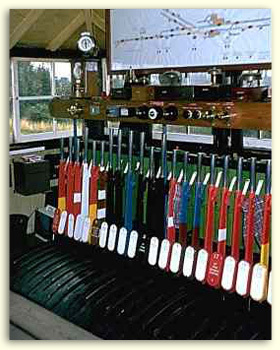 It is thought that the 25-lever frame was shortened to its present 23 levers in September or October 1976, by which time the remaining semaphore signals had been replaced. As each signal and point was converted to electric operation, the top of the relevant lever was shortened by several inches. The Southampton area and the line through Romsey to Salisbury had escaped conversion to multiple-aspect signalling during the 1960s electrification of the Waterloo to Bournemouth line, but modern technology finally caught up with Romsey in the 1980s. A major resignalling scheme saw the remaining signal boxes being closed with control being taken over by Eastleigh panel. Romsey signal box was closed on 17th October 1982, with the signals and many of the fittings in the signal box being removed at that time. See their website for many more historic photos of the railways around Romsey The Romsey and District Buildings Preservation Trust agreed to purchase the box for £10 and also agreed to fund the £1,000 removal costs. On the night of Sunday 26th June 1983, the wooden first floor, weighing about a ton, was lifted across the tracks to a temporary position in the school grounds on the other side of the embankment. The 23-lever frame, weighing over three tons, was then lifted over. 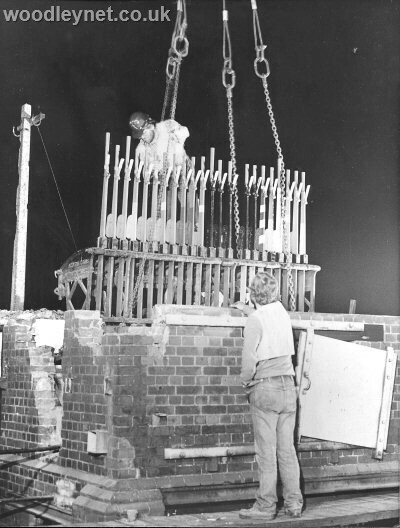 A new ground floor was constructed on a piece of land bought from Hampshire County Council, and in April 1987, the frame was lifted onto the new base, followed by the first floor. 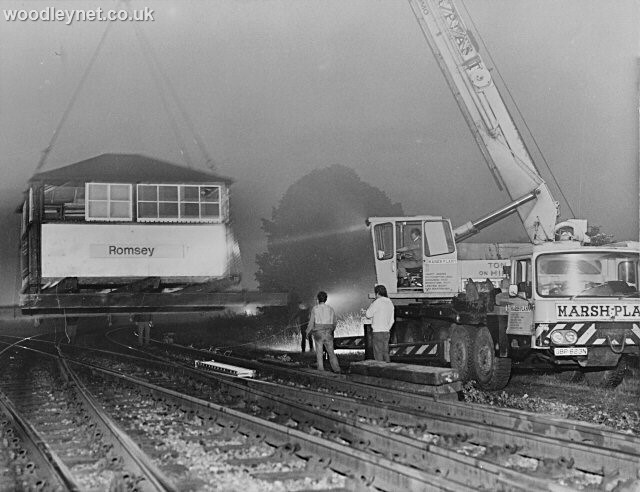 The Romsey Signal Box Project became heavily involved at this time, scouring the country to find suitable signalling equipment to fit out the signal box in a style similar to how it looked before closure. The resignalling of the Weymouth area provided many parts which now form part of the exhibit at Romsey. On 26th June 1991, the first signal (the original down branch home arm mounted on the down branch distant post) was reconnected to the lever frame, exactly eight years after the box was moved to its new location. Work then commenced on the construction of the simulator in the basement of the box, which, when connected to the instruments upstairs, simulates the actions of the neighbouring boxes. The completion of this work enabled the box to be successfully restored to operation on 17th October 1992, the tenth anniversary of its closure. Work has continued since then to make the site attractive and usable. The site now boasts working mechanical and colour light signals, a ground frame and a short length of track with a set of points. 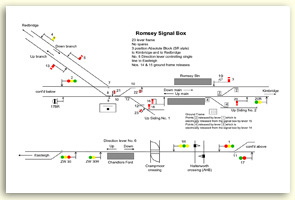 This enables the Friends of Romsey Signal Box to demonstrate most of the features of mechanical railway signalling, a technology that can be traced back to the 1870s but is still in use in many rural areas of the British railway system today. Below are three diagrams, please click on the thumbnail to enlarge the image. Lever pull plates and lever colours.